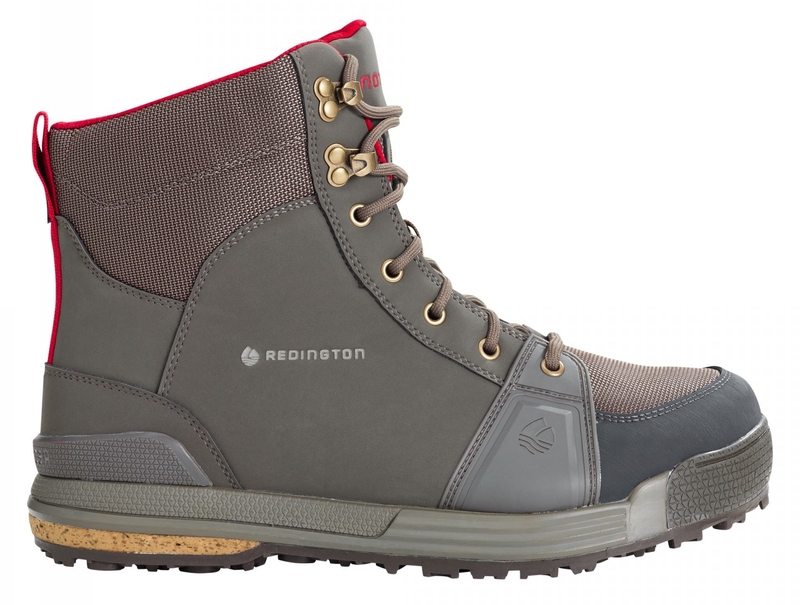 Redington is in a weird space; it’s a Farbank property and makes some great gear, but it necessarily cannot cannibalize sales from its big brother Sage (also a Farbank brand). This leaves it operating on the low end of the price spectrum where it overlaps with Sage’s core products of rods and reels (although it certainly makes some nice products in that space). The sneaky thing you have to consider about Redington is that there *is* no ceiling when it comes to product which cannot overlap the Sage catalog. This, to me, is where Redington really shines. I’ve been wearing some SonicDry wader pants for the last few seasons, and while I still have some complaints about the length of the legs, overall I’ve been very happy with that product, especially with the high build quality. The Prowler boot is very similar to the SonicDry wader line both in cosmetic look and in build quality (top notch). Indeed, these boots look really good with the SonicDry waders; clearly they are color-coordinated, but not all “matchy-matchy.” I especially like the cork touch in the soles, which actually does seem to be real cork. The most notable thing about the Prowlers once you put them on is their extreme width; these suckers look like moon boots on your feet. However, this width is very well planned; instead of swinging around to the inside, where you might trip over your own feet, these boots carry most of their extra girth along the outer edges. The extra width makes these a truly stable shoe, without sacrificing much in the way of weight. Another thing I like is the simplicity of the lace grommets. You don’t get Simms-style elevated boot grommets with these, but the truth is, those things are usually m y first point of failure on a Simms boot and I don’t miss them. I’m running these Prowlers simultaneously at present with an excellent set of felt-soled Simms Vapor Boots, and I find myself lacing up one versus the other depending entirely upon the situation. Snowy long-distance hiking the order of the day? Lace up the Prowlers, which are great on trails and don’t collect snow on the bottom like an orthopedic walking boot. The Prowlers are also more flexible out of the box, meaning there is no lengthy break-in period. Am I going to be wading slimy, smooth limestone or granite? Definitely choose the Vapors; because nothing beats felt for traction underwater. I recognize that it’s a luxury to have both felt-soled as well as rubber-bottomed boots, but the good news is, you really can’t go wrong with either of these contenders. Both look good, wear lightly, and will last a great deal of time. Although I haven’t had the chance to test the Prowlers in a felt bottom, I feel comfortable recommending these even when compared with full-on “guide” boots. Rating: 4 Stars out of 5 (nothing spectacular, everything very satisfactory).